Portree High Street @ High.St - High Street shops and High St businesses. Large Google map of Portree High St.
On a lovely day it is hard to beat the beauty of the Isle of Skye and the wonderfully friendly people. Of course there are indoor attractions, such as the Glendale Toy Museum and the reptile exhibition and breeding centre at the Serpentarium but it is those who love the great outdoors that will enjoy Skye the most. The area is a favourite with walkers and climbers but many others just come to see the wildlife, from the Golden Eagle to the Pygmy Shrew, through to the water-loving otters and seals. To make the most of the experience, professional tours are available on the island or you can take a sea.fari adventure to spot the whales. 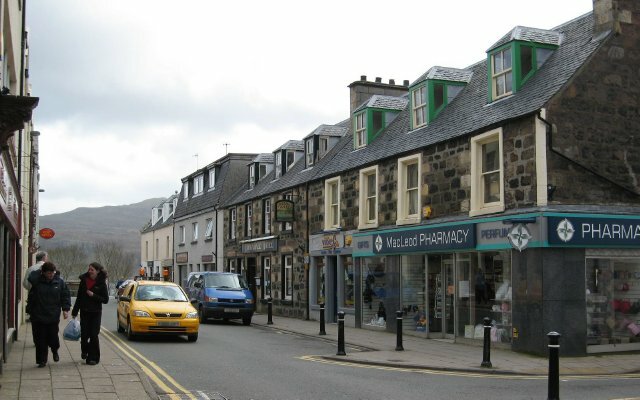 Portree's main high street is actually a number of streets loosley centred around Somerled Square. Being a relatively small town, we have also included as many of Portree's shops and businesses as we can. The shops listed below read like a book, we start top left going from West to East along Wentworth St, we then move down a 'block' (street) along Bridge Rd and The Green, again from West to East. Next we list the vertical streets starting on the left with Somerled Square, then Bayfield St and finally, Bank St and down to the harbour. The map will help you see how all these streets lie in relation to each other. A short distance from the town is the Cuillin Hills Hotel with its beautiful views across the bay and, of course, out to the Cuillin Hills. For more information, try www.isleofskye.com or the official Skye website.